Apple, Inc. Q3 Earnings: Will Gross Margin Continue to Improve? The days of Apple's declining gross profit margins have passed. In fact, Apple's profit margin is actually improving. And this trend looks poised to continue. While the concern about Apple's (NASDAQ:AAPL) gross profit margin is no longer as big of a deal as it was a year ago, it's still important. After all, Apple's lucrative gross profit margin is downright uncanny. If this important metric began to decline for a prolonged period, it could make year-over-year EPS comparisons quite ugly. So let's check in on the metric to see where it could be headed in the near future. A little over a year ago, when Apple stock was reaching post-split levels below $60, investors were worried Apple's suffering gross profit margin metric could continue rapidly downward. Apple's second-quarter 2013 gross margin of 37.5% was down nearly 1,000 basis points from the 47.4% it reported in the year-ago quarter. Investors wondered: Where was the bottom to this scary trend? Apple's iPad Mini had taken its toll on Apple's profitability. While the tablet was a hot seller, the lower $329 starting price compared with the larger iPad's $499 pricing meant the segment's margins suffered. And this weighed on Apple's overall gross profit margin. Apple CEO Tim Cook warned shortly after the iPad Mini launch that its gross profit margin is "significantly below" the company's corporate average gross profit margin. In the year-ago quarter to Apple's fiscal 2013 second-quarter earnings, the iPad Mini wasn't yet for sale; this made comparisons tough. But the days when the iPad Mini weighed on Apple's gross profit margin are long gone. As Apple drove costs for the new product down, and the Mini started showing up in year-ago comps, Apple's profit margin has been headed uphill ever since. The iPad Mini, contrary to the market's opinion, was not the beginning of a broader trend to spread across Apple's product lines. Apple has maintained both pricing power and favorable cost curves across its products. Where's gross profit margin headed now? 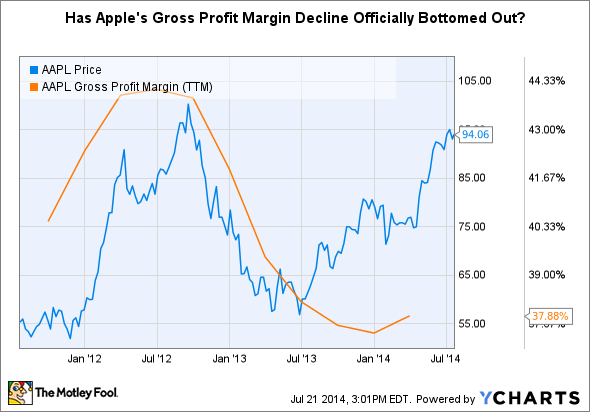 More recently, Apple's gross profit margin has been rapidly improving again. Source: Data retrieved from SEC filings. The trend has been helped by growing sales in Apple's most profitable segment, iPhones, a likely improving cost curve for Apple's iPad Mini, and a higher percentage of the more profitable larger iPad sales because of the iPad Air that gave the larger line a significant overhaul. Going into Apple's fiscal third-quarter earnings report, Apple has guided for another year-over-year gain for its gross profit margin. Apple expects gross margin to come in somewhere between 37% and 38%. Last year, Apple recorded a gross profit margin of 36.9%. Notably, however, Apple has beaten its guidance midpoint for gross profit margin by 40 basis points or more in the past four quarters in a row. To top it off, Apple has been beating its gross profit margin guidance more considerably in the past two quarters. Source: Data retrieved from SEC filings. Midpoints from guidance range used. Despite Apple's midpoint guidance for a gross profit margin of 37.5%, I'm estimating Apple will post a gross profit margin of 39% or more, especially if iPhone sales outperform expectations. While a 39% gross profit margin would not be a sequential increase from Apple's second fiscal quarter, the seasonal nature of Apple's business typically leads to a sequential decline because of lower iPhone sales and because buyers hold out for the latest-generation iPhone -- so a sequential decline between Q2 and Q3 is nothing new. But a 39% gross profit margin for Apple's third-fiscal quarter would continue to improve Apple's trailing-12-month gross profit margin. While it's hard to predict how much more Apple can improve its TTM gross profit margin, it's clear that Apple's lucrative margins may be more sustainable than the doom and gloom storyline of plummeting profit margins in late 2012 and 2013 insinuated.